What can we say about the 4-5-1? Something like, offense sells tickets and defense wins championships. 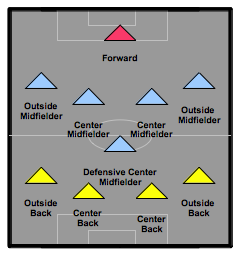 A solid formation centered around team defensive shape and unity can be a corner stone of a long term successful squad. If you know the importance of team chemistry, togetherness and hard nose D, then you'll love this set up. Still thinking of lining up with this formation are you? Well there are some important things you need to know. Things like the overall impact the formation has on the field and the players playing it. 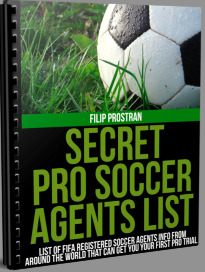 Detailed specifics position by position as used by professional sides are outlined here. Is this A Very Conservative Formation? Depends how you look at it. Either you think defense wins championships or you don't. Although this 4-5-1 formation with only one visible attacking threat in the lone striker may come off as reserved, don't judge a book by it's cover. This formation when defending stays as is, but when on the attack this formation quickly transforms into a dangerous 4-3-3 with flanks flying and midfield lines pushing forward. Discipline behind the ball, clinical with it, this is the 4-5-1 as we know it. What's the Hardest Working Position in this Formation? The easy answer is that every position has it's difficulties and struggles which is true. But, we can not deny the strikers and the outside midfielders constant work. The striker is responsible for initiating the defensive pressure as well as dotting the "i" on any play forward. A lot to ask for from one person. Now the outside mids have relentless work up and down up and down all game long. They have to work like dogs on the defensive end then make countless runs forward without being rewarded majority of the time. Story of my life. This must be played by a selfless player who is a deadly two way player with a tank that can go for days. -High work rate for defensive pressure on the back line of the opponents, funneling them in wider areas and forward not backward. 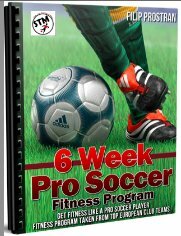 If you like what you heard the 4-5-1 may appeal to your style of play or coaching style. It is difficult to get players (especially offensive minded ones) to buy into this system. When players first hear 4-5-1 they automatically think defense defense defense. On the surface it seems extremely defensive but after playing in it for a while you'll realize the offense freedoms it actually has. You may only get one or two quality scoring chances a game because of the nature of the set up, so you need to take your opportunities as they come. If you fail to capitalize on your looks, you're going to be hard pressed to get good results, hope you like 0-0 draws.